to let you know i've been SCRAPPING!!! yeah...i know. the end of the world is now upon us. i apologize for bringing 2012 two years early. but my mom-in-law surprised me with a vintage typewriter and i couldn't wait to use it. here's the 1st thing i did with my new toy. 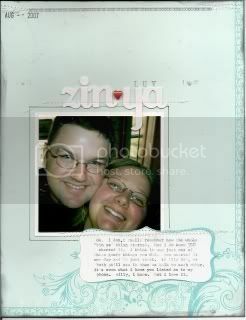 this is a layout i did about the nickname my hubby and i use for each other. journaling reads: "ok. i don't really know remember how the whole "zin ya" thing started. but i do know YOU started it. i think it was just one of those goofy things you did. you started it one day and it just stuck. to this day, we both still use it when we talk to each other. it's even what i have you listed as in my phone. silly, i know. but i love it."